Ships tomorrow if you order in the next 17 hours 54 minutes. Occasional bouts of sleeplessness may have a real large effect on your overall health and wellness. Your body possesses natural circadian rhythms and sleep patterns, but factors such as a poor daily diet, high levels of stress, and consistently poor sleeping habits may all have an effect on these patterns and rhythms. 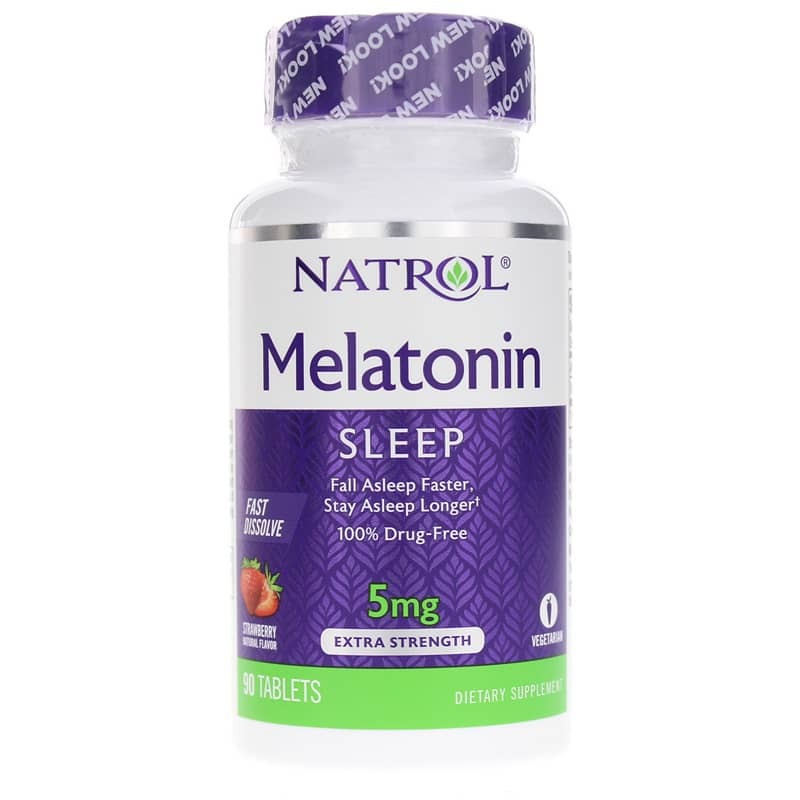 Natrol offers a product called Melatonin 10mg Fast Dissolve, a dietary supplement that provides 5mg of melatonin to help support and maintain healthy sleep patterns and circadian rhythms. Just one tablet about 20 minutes before bedtime may help you stay on the natural pathway toward a restful night's sleep and regulated sleep patterns. It comes in a great-tasting citrus flavor that you'll love. Tablets dissolve and absorb quickly, so you may be asleep sooner than you think. Start sleeping better tonight. Give Melatonin 10mg Fast Dissolve from Natrol a try today! Other Ingredients: Xylitol, Cellulose Gum, Soy Polysaccharides, Maltodextrin, Dextrose, Crospovidone, Modified Food Starch, Silicon Dioxide, Malic Acid, Natural Flavor, Stearic Acid, Beet Root Extract, Magnesium Stearate, Citric Acid. Contains NO: milk, egg, fish, crustacean shellfish, tree nuts, peanuts, yeast, artificial colors, flavors, or preservatives. 100% Vegetarian. Adults: Take 1 tablet 20 minutes before bedtime. No water necessary. If you are under medical supervision or using any tranquilizers or sedatives, seek the advice or your healthcare professional prior to using. Consult your healthcare professional prior to use if you have an autoimmune condition, depressive disorder, or are pregnant or lactating. Not for use by children under 12 years of age. Do not take when operating machinery or driving a vehicle. People with allergies to soy, wheat, or corn should consult their healthcare professional before taking this product. Keep out of reach of children.